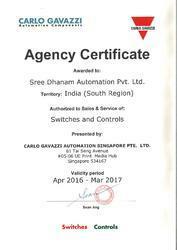 Known for Wholesaling and Importing a wide range of high quality Automation Products, Sree Dhanam Automation Pvt. 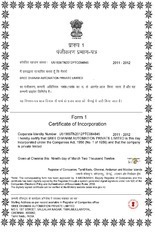 Ltd. has came into existence in the year 2012. Offered product range comprises of best quality Proximity Sensors, Industrial Relays and Energy Management Equipment. 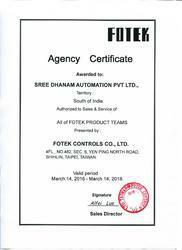 To ensure optimum standards of quality, these automation products are obtained from trusted and reliable vendors. Manufactured as per the industry set standard at the vendors’ end, these products are highly demanded in the market for their long functional life, steady performance, hassle free operation, easy maintenance and compact design. The offered products are widely used in textile machines, wood working, plastic molding and ceramic working machines. Keeping the convenience of our customers in mind, we offer these products in bulk quantities with tamper proof packaging at cost effective market prices. Since the inception of our company, we have been supported by a well-equipped warehouse unit, which is spread over a vast area of land. Our warehouse is well-equipped with different kinds of tools, machines and equipment required for a standardized storage operation. The warehouse unit is regularly upgraded with the latest technology to meet the ever-changing market needs in the most efficient manner. Loading and unloading of final products are carried out by a team of highly skilled warehouse experts. Our organization was established as a private limited company and is currently operating under the expert supervision of our CEO, Mr. K. Sugumar. Owing to the innovative business ideas and transparent dealing polices implemented in our organization, we have gained a huge clientele across the domestic market of India. In addition to this, our company has lately carried out a computerized management system, which allows effective supervision of procuring, storing and purchasing in a highly efficient method. Our importing countries are Singapore, Italy and Taiwan. 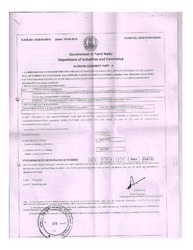 Our company was incorporated under the companies act, 1956. Our organization has been well-supported by a team of highly skilled and experienced professional since its inception. Our team comprises of skilled & semi-skilled labors, procuring agents, technicians, engineers, warehouse & packaging experts, quality controllers and sales & marketing executives. The employees are carefully selected through rigorous selection procedures conducted by our team of human resource professionals. They are trained on a regular basis through seminars and workshops, in order to meet the diverse requirements of the market in the most efficient manner. Furthermore, they work in close coordination with each other in order to attain a hassle-free working environment. Infrastructure plays an integral part to produces better quality products in all types of industries. 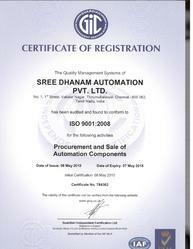 We Dhanam Automation have highly advanced and modern infrastructure. Being an experienced distributor and supplier, we cater various requirement of the customers. Our company has well-equipped store housing facilities to store our products sourced from the best manufacturers. Our dedicated and highly experienced team of product supervisors and managers has made the constant development in infrastructure. Our purpose to achieve maximum client’s satisfaction through our range of automation products has been possible with our tie-ups with distinguished manufactures like Carlo gavazzi, Precision, Meanwell and Fotek. We have extremely talented sourcing agents that meticulously survey the market for trustable and reliable vendors who help us in upholding our credibility in the market. Our vendors are selected on the basis of good infrastructure, advanced manufacturing unit, latest machines and skilled workforce. Moreover, we encourage our clients to pass their valuable suggestions so that we can incorporate in the range with the help of our vendor base. We procure our range of automation products through our international network of vendors spread across countries like Italy, Taiwan and Singapore who always ready to supply us essential equipment with in a short span of time. Owing to our association with some of the well recognized vendors, we have been offering quality automation products to our clients. These products find a wide application in automation processes of varied industries. We have been able to gain the trust of our valuable customers with our ability to meet bulk orders within the stipulated time frame. Offered product range is carefully procured from trusted, certified and reliable vendors in order to ensure steady performance and optimum functional life. The optimum quality of these products is attained through rigorous quality assurance procedures conducted by our team of quality controllers. Our customers can avail these products in bulk with standardized packaging owing to our well-equipped warehouse and packaging unit. Owing to our well-connected distribution network, we deliver this product range within the promised time constraint. Applications: Carlo Gavazzi offers a comprehensive range of Inductive Sensors - primarily used to detect metal parts and objects. These sensors are used extensively in packaging and plastics machines, assembly lines and conveyor systems. They are available in a wide variety of styles and feature both digital (SCR, transistor) and analogue outputs. Carlo Gavazzi offers inductive sensors in cylindrical housings (from 4mm to 30 mm) with both standard and extended sensing distance and in a flat-pack housing.